Alexander Hume Ford : The Passing of the Outrigger Canoe, 1911. Ford, Alexander Hume: The Passing of the Outrigger Canoe. Volume 2, Number 5, November,1911, pages 440 to 450. An overview of the use of outrigger canoes across the Pacific, largely based on personal experience, by Mid-Pacific Magazine publisher and one of the founders of the Outrigger Canoe Club, Alexander Hume Ford. While there is some variation in design or construction, importantly Ford reports that canoe surfing is not confined to the Hawaiian Islands but is also practised in Somoa (Apia Bay, page 447) and Fiji (page 449). 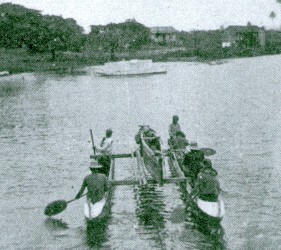 The Whiteman's Use of the Outrigger Canoe. From painting by H. G. Hitchcock. Every year the fleets of outrigger canoes are growing smaller. In some of the South Sea Island waters this picturesque craft has ceased to exist. In others they are no longer buIlt and when those that do exist have rotted away or are lost at sea, there are none to replace them. The great koa trees from which the Hawaiian canoes are cut and carved, are only found today far up the side of the peak that towers 14,000 feet above the sea, and the natives no longer fell and drag these down to the beach. The outrigger canoe will pass away, perhaps in advance of the disappearing Polynesian. In Samoa the last of the great catamaran war canoes lies rotting on the beach at Apia. It once carried 400 warriors, but it is safe to say that it's like will never again be built; few indeed remain who may still bind together with bits of sennit (cocoanut fibre twine) great forest planks; so closely that the roughest storm does not start them so far apart as to let in one drop of water. The Somoans gave the last great result of theIr dying art to the Emperor of the Germans, and an offer was even made to sail it with a native crew to Hamburg, but there lies this wonderful masterpiece of Samoan handicraft a little longer food for the reflection of the passing tourist and the present abode of the devouring white ant. New Zealand and Samoa both forbid their masterpieces of native work to leave the country of their creation, but with what a difference! In olden times canoe and spear making was the pastime of the men. On many of the islands one may still watch the men, and even boys at work fashioning the old style of outrigger with primitive implements. 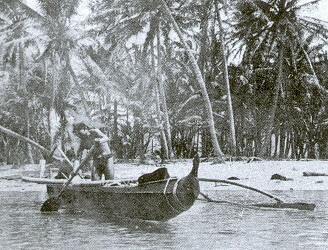 Each island and tribe preserves its own peculiar form of constructing the outrigger canoe, and in the New Hebrides where the flotsam and jetsam of the Pacific people have been gathered by ocean currents and devastating storms, one may study a hundred types of canoes in as many villages, where various South Sea languages and traditions are still held sacred. From Fiji. From the New Hebrides. ... two, or an entire group may use four poles, but in different combinations. Sometimes the four close together near the center of the boat, sometimes two near each end or three at one end and one at the other- but each combination tells its tale. I recognized at Fortuna in the New Hebrides the little short outrigger poles of Samoa - and the natives of this island speak Samoan. Even at the mission schools where many gather from all the isands, you may tell the tribe from which each comes by the manner in which he constructs his canoe. Alas and alackaday, however, in these modern days the South Sea Islanders more and more every year devote their waning skill to fashioning toy models of the old time canoes for the passing tourist, and trust to the local missionary in time of emergency for a lift in his modern machine built whale boat. Even the spears of the South Sea Islanders are now turned out by machinery and supplied in bundles in exchange for copra - idleness is becoming rife and the people are rapidly dying - evidently of ennui. The sphere of the outrigger canoe is bounded on the north by the American Territory of Hawaii, on the east by the American possession of the Philippines, on the south by Tahiti, and on the west by Ceylon. In the great vast ocean between these four groups of islands the outrigger canoe for more than a thousand years was king. It is possible that the outrigger canoe is a Singalese invention. 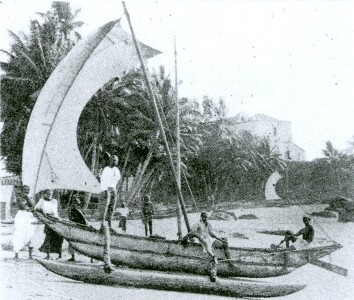 At any rate, Europeans visiting the Pacific by way of the Suez first meet the outrigger canoe and its first cousin, the catamaran, at Ceylon. From here around the Pacific by way of Malay, Java, the Celebes, Philippines, New Guinea, Fiji, Samoa, Hawaii, and Tahiti the outrigger canoe is still the boat of the people. Only the Solomon Islanders and the aboriginals of Australia know nothing of the outrigger canoe, and both of these are negroid races. Surfing in an outrigger is king of water sports, and in Hawaii anyone may learn to handle one of these craft with a little practice. I first became acquainted with the outrigger at Waikiki, and there I remained until I thought I had mastered the rudiments of guiding this obstreperous craft. Moving on to Fiji I was initiated into the mysteries of "jumping" a reef, a common practice in South Seas, when there is no other escape from a threatened hurricane. ... ever find its way to permanent use in Atlantic waters. A single Hawaiian outrigger canoe made its appearance some years ago at an Oregon coast summer resort; it was built by a young Hawaiian especially to ride the gigantic billows that upon our Northern Pacific strands, wrecking any ordinary boat caught before them and rolling the largest life boats over and over, much to the discomfiture of the oarsmen, who are always lashed to their seats. The outrigger of this big canoe was constructed of steel, a pointed cylinder peculiarly adaptable to the conditions to be overcome. Many successful runs were made before the great walls of water that come rolling in from the ocean, and people marveled at the nerve of the young Hawaiian, who ivariably kept his boat before the surge. But one day the accident happened - an unusually high sea was running and the sport seemed glorious for an adventurerously inclined person. The young Hawaiian's chum, a white lad, pleaded to go along, and as he had proved an apt pupil, he was. taken in the canoe, with strlct admonition that in case she swamped or upset not to jump out, and above all things always to leap from the canoe on the outrigger side. 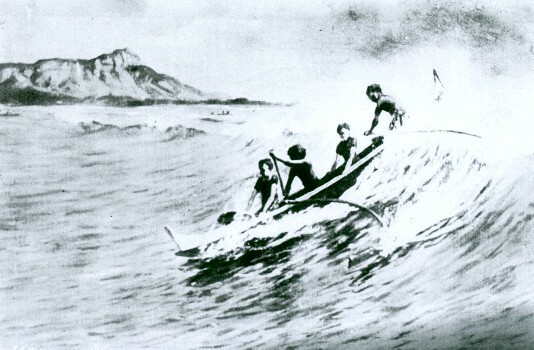 A wave more heavy than any before put such a strain on the guiding paddle that it snapped, and like a flash the canoe began to bring up broadside to the then cresting breaker; the young white man leaped into the sea to swim ashore and the sharp pointed end of the outrigger struck him on the head. His companion, crazed with grief, destroyed his canoe and has never since engaged in surfing. So ended outrigger sports on the Pacific Coast of the mainland. I took my first lesson at outrigging in the canoe that had carried Alice Roosevelt so successfuly before the surf that rolIs in at Waikiki, but had balked at commodating the bulky form of Mr. Taft. It was while this self-same Acting Governor of Hawaii was initiating Alice Roosevelt into the delights of surfing in an outrigger, that the great mail steamer from Japan lay at the Honolulu dock screaming itself hoarse for her to return and finally left without her so that Alice was compelled to follow to the outer harbor by tug boat. How Miss Roosevelt ever tore herself awav from the sport of surfing I do not yet understand, but I do know that as a married woman she returned to Hawaii that her husband might learn the art of surfing. As a malihini I was captivated, as are many malihinis, by an outrigger lying on the sand under the shade of a hau tree that grew at the water's edge. The particular hau tree also provided umbrageous protection for the Acting Governor's outdoor dining room, which was beautifully floored with the same native mahogany out of which his canoe was constructed. If I were writing for the malihini I should explain that the outrigger canoes are built on the Island of Hawaii where grows the koa tree; from one of which the canoe is shaped, then dug out; a strip of perhaps six inches being added as bulwarks, and so cleverly joined that no novice would discern the crack in the highly polished surface of the canoe. ... pole of lightest wood, called in Hawaii the ama; it is two-thirds as long as the canoe itself, and perhaps six inches in diameter. It floats from six to twelve feet from the canoe and is connected by two curved poles - iakos. The Hawaiian outrigger is the largest in proportion that I have noticed anywhere on the Pacific, which, of course, makes it all but impossible for the craft to upset completely. I say almost, for there is the possibility of a splendid spill, if the waves run high and the man at the steering paddle loses his nerve or fails in skill. Unlike South Sea outrigger canoes I have carelessly boarded, the Hawaiian craft does not either upset or sink her outrigger if the weight is thrown in that direction. She behaves herself until the native takes the paddle in hand. I knew something about sending a birch bark skimming along smooth waters so I took a paddle confidently while my companion sat complacently in the bow - to watch proceedings. We were to go out to the big breakers, but to my astonishment every little ripple semed to turn the canoe broadside to the sea. I tried paddling on the outrigger side, then switched to the other - a gentle whitecap came aboard and swamped us, and I was given my first lesson in aid to the sunken. We both jumped out into the water - no one ever goes outriggering at Waikiki except in a bathing suit. My tutor ducked beneath water, put his shoulder under the bow and with his feet firmly on the hard sand exerted all his strength, the canoe tilted on end and the water gushed out; suddenly my companion stood from under, down went the bow and the remaining waters rushed forward and splashed over end in a fountain; it took but little effort then to bailout what was left, and once more we clambered aboard via the off side from the outrigger. The Hawaiian outrigger canoe does not easily upset, but a child can swamp her. My tutor took the steering paddle and we shot out through the incoming rollers, mounted waves, turned our broadside to swells and were lifted over them, kept out prow right in among foaming crests and scarcely shipped a drop. At last we were a mile out among the great long swells of the ocean, beyond the outer reef. paddlers: they found a pair of trunks quite sufficient. The most experienced man always sat in the stern and guided the craft with his great fan-like paddle. It was he who kept his eyes ascant for the "Nalu nui" or great wave. Roller after roller might pass, but they were not the kind that would carry the narrow craft up to the beach-a mile away. At last while on the top of a swell he would give the cry "Nahu nui !" and then everyone would bend to his paddle and await the word of command. "Hoe! Hoe !" and the paddles fly throllgh the water, the canoe propelled by several powerful pairs of arms gathers speed - over shoulders the great long roll of water can now be seen approaching. "Hoe! hoe! hoe! hoe!" cried the steersman, as he plied his own paddle with wonderful quickness: the long sweeping base of the oncoming roller begins to lift the back of the canoe, and now evervone drives his paddle as if mad; a little more exertion and the wave is caught - a little less and it is lost, the canoe merely sinking back over the crest. The canoe is tilted now seemingly at an angle of forty-five degrees, she is plunging downward before that onrushing wall of water; paddles dipping into the racing brine now are almost torn from the grasp. The helmsman cries "Pau !" ( enough), everyone else rests and his labor begins: with all its force the water seeks to swirl the craft around so that it may catch its outrigger broadside and send it toppling above the heads of the people in the boat, as the wave breaks. Perspiring at every pore the man at the paddle braces against Father Neptune, as his craft shoots faster and faster down the face of that ever-steepening mountain of water. Now there is a rushing, hissing sound, the boat seems to lift on beam ends and there is a churning of white foam all around the helmsman; the stern of the great long canoe rests upon the crest of the wave, its bow is down in the depths. A false move now, or should the paddle break - and this sometimes happens - there would be a sudden bringing up broadside to the wave, the light outrigger would be lifted high in air, and if the boat did not speedily swamp a complete capsize might occur; this seldom happens, however, and the canoe goes speeding on before the wave, and the excitement approaches its climax. It was well that I learned to ride upon the waves in my outrigger with the Hawaiians, for in the South Seas I was compelled more than once to "jump" a dangerous reef in a tiny craft with an outrigger not much larger than the paddle usually in service at Waikiki. In the Hawaiian canoe if the wave proves too strong, it is usually possible to back water and fall back above the crest of the wave into still waters - not so with the South Sea cockle shell. You may leave your helm as the wave dies down at Waikiki and run forward to tilt the bow downward so that she will keep going until the succeeding breaker lifts her stern and sends her flying onward with renewed vigor and lands her gently high and dry upon the sloping beach. In Samoa such a feat is reserved for the most expert of the native boatmen, for the tiny outrigger is meant barely to balance the boat, the occupants are supposed to keep her equilibrium; the Samoan boats when propelled by the sweeping native paddles dart through the waters like flashes of light, but I have found that under the guidance of a novice, or one accustomed to the comparatively ponderous canoes of the Hawaiians, that they have a way of dipping their outriggers upon the slightest provocation, and once the outrigger dips, or lifts out of water, which it is prone to do, over goes the cockle shell and the once occupant has to bailout and get in again - South Sea Island fashion. My first experience with a Samoan canoe was in a quiet lagoon. Trusting to the balancing power of the outrigger, I nonchalantly leaped in, despite the cries of warning from the natives. Instantly the tiny outrigger described an arc in the air, and as I, forgetting the Hawaiian rule, jumped out on the off side, it came down and struck me on the head, my boat now bottom side up. for me that the Samoans build their outrigger floats of light sticks of wood. ... with the custom of his people. First he sped the canoe firmly by the thwart amidships and sent it forward with all might, and as the stern passed him reached out his arm and gave the littleboat a jerk in the other direction until the water within went flying over the bow and sides in a solid sheet. He repeated this maneuver several times, until scarcely a drop of water was left in the canoe, then invited me to get in from the off side. I did so, and down went the outrigger on the other side, and once more there was a capsize. The next time I seized the bow with both hands and straddled, carefully balancing myself until I was safely aboard. I noted that my guide sat with his legs crossed under hlm across the thwarts, while I, unaccustomed to this pose, had to put my feet ,one before the other, in the narrow little slit that widened out below - for the canoes are dugouts, widest just above the water line. In this uncomfortable position I attempted to paddle, and for the third time capsized my craft. After that I settled down to learn the art of managing an outrigger canoe built to suit the requirements of the Samoan. To the end of my stay I handled the Samoan canoe most gingerly. All around me in rough weather or smooth the Samoans would speed by, bobbing up and down in their canoes, amid the reefs heedless of choppy seas or heavy rollers - but after the Hawaiian pleasure craft the Samoan cockle shell is little to my liking. The natives, it is true, come riding in before the surf that rolls into Apia Bay, but there are upsets on the reef, and the coral is sharp and its cut in this climate not to be trifled with. Then, too, the Samoan canoe is so easily swamped by a novice - and I have noticed that the native is frequently engaged in the water, bailing out his canoe, Samoan fashion. He can board his craft again with lithesome ease, but in a choppy sea it is a knack to be learned, to leap aboard again without swamping the little craft. Of course the Samoans have some large canoes; they used to build war catamarans that would carry three hundred warriors, but they were not the canoes of the people. A Modern Canoe Shed - Hawaii. ... the stormy season - which lasts for more than half the year. For all around comfort and a long cruise commend me to the Fijian outrigger - it never capsizes and you may take your bed with you and sleep beneath a roof of cocoanut leaves erected over the platform built between the outrigger proper and the canoe. In Fiji there are rivers, real rivers; and all kinds of bays and inlets, and on them all, the native plies his outrigger. On the two large islands it is possible to go far up into the mountains and at some native village near the headwaters of a river secure a canoe that managed by two Fijians will carry you saiely through all the rapids, down the river and even outside the coral reefs or the coast. The canoes seem tiny and zigzag in and out with the currents of the upper courses, but on the flooring laid between the outrigger sticks, are clean mats and a pile of earth upon which the fire is built for cooking, and perhaps an old Standard Oil tin is there to do service as a stove. By day there is a sloping roof of cocoanut leaves to give shelter from the rays of the sun and at night wild banana leaves are spread, forming a most easy and comfortable bed, as I have reason to remember. There are thrills, dear to the heart of the lover of sport, as the tiny canoe shoots the rapids, and sometimes jumps a tiny cascade, but for real excitement, commend me to the care of the nervy Fijian who enjoys jumping his canoe over the reef, on the crest of the great rollers that thunder down upon every bank of coral in the Pacific. It takes more than skill to jump a reef if there is the slightest sea on. Nerve and strength plays most important part. not a foot below water at some tides, descend hundreds of fathoms, sheer precipice on the side toward the great ocean. A Hawaiian and His Canoe. ... that comes surging in, but a constant piling up of the green waters, short waves that drop in rapid succession upon the hard coral. Then, as the waters recede, there is a Niagara falling over the edge of the reef into the ocean; let any boat get caught in this, and if she is not borne beneath the usual projecting ledge and held there by the currents, dismemberment at least will be her fate and woe betide the occupants who have not learned the art of body surfing - that is keeping the body rigid, and catching an advancing wave and riding before it; mere swimming would scarcely land anyone safely over a coral reef. Outriggering over the surf-bound reefs of Fiji is sport for the daring. My first dash over the coral reef was accidental; that is, we had gone out for a quiet day's fishing and the wind arose, moreover such a current set outward through the channel between the reefs that it seemed as though we could make no headway and every moment the waves rose higher and higher. The two Fijian paddlers looked at the line of foam upon the reef and then at their catch of fish in the bottom of the canoe. It was a long way round by the still water passage, even if it could be made, and not a hundred yards across the foam covered reef to the quiet waters of the lagoon within. One of the Fijjians turned his paddle in the direction of the reef, and soon we were riding broadside on the great rollers not a hundred feet from where the short high waves dropped down upon the coral rocks. Several waves passed, and then one monster came howling in. In the twinkling of an eye the sharp point of our canoe was pointed to the reef and we were sloping down that almost perpendicular wall of water; it seemed as though we would drop bow on upon the reef, but the monster wave bore us on, spent its force, then there was a grating, grinding sensation, and the two Fijians leaped out upon the coral and strained with all their might to hold the canoe from being swept by the back wash into the ocean and perhaps beneath the fearful ledge - that graveyard of the coral reef. Many a whaleboat has been turned over and over in the reef, and the poor sailors ground to pulp on the jagged coral. ... dIed like mad; we were over the reef and had made it in two jumps. Since writing the above paragraph I have read in an Auckland paper a telegraphic despatch from Fiji announcing that a missionary, (a man who initiated me in some of my first water sports in Fiji), has been drowned with two na-tives - trying to jump a reef. I know the reef; he has probably jumped it scores of times, but this trip doubtless, the bow of his craft did not touch the coral, and then all was over. I was canoeing among the Tongan Islands at the period of this accident, - the Tongans are the nearest neighbors to the Fijis, some 700 miles away and taught them to build their largest war canoes. Once the Tongans built great catamarans and gigantic outrigger canoes with which they invaded Fiji, and to this day some of the Fijian Islands are more Tongan than Fijian. Here the outrigger boats are the largest, some of them still large enough to accommodate on deck half a village, and the Fijians and Tongans still enjoy racing each other in their tribal canoes. Sometimes a score of sailing canoes will take part in one of these contests - but always in Fijian waters, for among the Tongan Islands there are few outrigger canoes to be found nowadays, and the stay-at-homes have lost their daring. I have seen Tongans leap out of their canoes until a steamer passed, for fear of her swell. In all the Tongan Islands, I saw but one fair-sized outrigger canoe, and this was hauled up on shore and dismantled. The days of the outrigger in the South Seas are numbered. You may remain for days or weeks at Suva, tlte metropolis of Fiji, and not see one. the more modern clinker built. For a safe boat in almost any surf, however, the properly constructed outrigger has no rival. The Solomon Islanders alone have discarded the outrigger. Twenty of their warriors will balance and propel a canoe that is as frail and cranky as a paper racing shell. In the New Hebrides, each island and tribe has its own particular style of outrigger canoe. Some have a dozen iakos connecting the body of the canoe with the ama, others only two. I brought one little New Hebrides canoe back to Hawaii with me, for it was my fond intention to have and preserve in time, at Waikiki, a collection of outrigger canoes from every part of the Pacific. I hope yet that this may be done. The South Sea Islanders and their native craft are passing away: let us at least rescue the Hawaiian outrigger from oblivion and make it our national pleasure craft for sporting safely upon the crests of the billows that roll in at Waikiki and over other shelving reefs that slope up to the Hawaiian Islands. Volume 2, Number 5, November,1911, pages 441 to 450. Geoff Cater (2011) : Alexander Hume Ford : The Passing of the Outrigger Canoe, 1911.